An estimated four out of five Americans will experience back pain at some point in their lives. For many of us, myself included, that back pain is present more often than not, and it’s the sort of pain that can prevent a person from doing (or enjoying) even simple activities and movements. If lower back pain is bringing you down, the logical course of action is to visit your doctor and hope that they can provide a solution. Unfortunately, the typical recommendation from a doctor is to pain-alleviating drugs or steroid injections, none of which actually address the root cause of the problem and can result in a range of nasty side effects. A visit to the physiotherapist or chiropractor also has its problems, and you can often walk out in more pain than when you walked in! This is especially true when the therapist in question doesn’t have a good idea of what it is that’s causing your back pain, essentially forcing them to act blindly and sometimes make the situation worse. The preferable solution, then, is safe, effective home remedies for lower back pain. Some of these remedies are so effective that they have been scientifically proven to be at least as effective (if not more so) as standard pharmaceutical painkillers. The ingredients for these lower back pain remedies are cheap, you usually have at least a few of them in the pantry or fridge, and when used correctly they won’t elicit the same side effects as common prescription painkillers. So why the heck wouldn’t you give them a go? There was a time in history when comfrey extract, either from the leaves or the root, would have been the leading recommendation for back pain from healers and physicians. And while those medieval doctors might have got most things wrong when it came to fixing common ailments, this wasn’t one of them. Comfrey is still widely used by alternative healers today, and it’s called “knit-bone” for a reason: it really does speed up the healing of bones! A 2009 study published in the journal Planta Medica examined the effectiveness of comfrey root ointment in treating acute lower and upper back pain. The results showed that after just one hour of applying the ointment, patients experienced an average decrease in pain of 33 percent. Not only that, after applying the ointment for five days, there was an average decrease in lower back pain of 95 percent… that’s pretty darn impressive! Be sure to only use comfrey root for short periods of time, however. Using it for more than ten days can run the risk of overloading your liver and causing damage. It sounds like the sort of ingredient that a witch would add to her boiling cauldron along with newt eyes and toad warts, and perhaps it should be! Devil’s claw is so-named because of its fearsome spiky appearance, but this so-called claw has some amazing health benefits that can be utilized to ease your lower back pain. Devil’s claw contains a range of bioflavonoids and phytosterols that have been linked to strong anti-inflammatory effects, including the powerful harpagoside — a glucoside that has been shown to rival curcumin in its ability to lower inflammation. A literature review that examined the findings from 12 studies of devil’s claw extract found that devil’s claw powder was effective in treating osteoarthritis of the spine — probably the most common cause of lower back pain. While most studies recommended oral devil’s claw supplements for alleviating back pain, there are effective devil’s claw ointments available that you can rub into the skin on and around the source of your lower back pain. The pain-alleviating properties of cayenne pepper are legendary, but the mechanism by which it alleviates that pain is just a little bit strange. Capsaicin, the active ingredient in cayenne pepper, stimulates nerve endings in the body to produce a chemical receptor called substance P. Ingesting or rubbing cayenne pepper on your skin actually overstimulates the substance P receptors and eventually tricks the brain into thinking that there is no longer pain at the site of application. Add to that cayenne’s ability to aid digestion, fight diabetes and dispel headaches, and you’ve got one serious home remedy sitting in your spice cabinet. 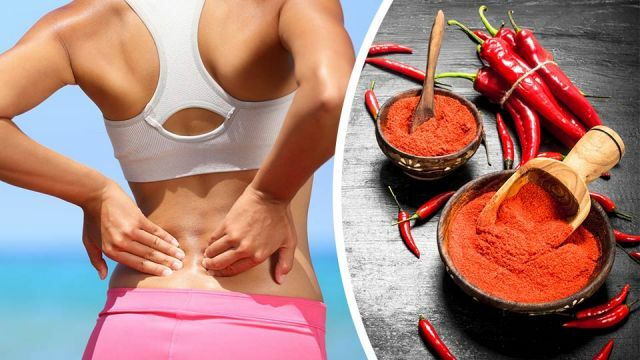 A study published in the aptly named Journal of Pain examined the effect of putting a cayenne pepper plaster on patients suffering from lower back pain. After three weeks of wearing the plaster, patients reported a 42 percent reduction in pain and four out of five participants reported being symptom free simply from using the cayenne plaster. Cannabidiol oil, otherwise known as CBD oil, has received a lot of attention in the scientific literature over the past decade for its ability to dramatically lower pain in a wide range of patients. A 2016 study, for example, tested the effect of using CBD oil on 274 patients suffering from treatment-resistant chronic pain. At follow-up, there were significant reductions in pain symptoms, severity and interference, along with almost half of the participants having discontinued opioid painkiller use as a result of the cannabidiol effects. While medical marijuana has certainly been proven to help in chronic conditions like lower back pain, one of the best ways to treat location-specific pain without any adverse side effects is to use a CBD salve. Certain companies, like this one, produce high-quality CBD-based salves specifically designed to treat both acute and chronic pain like that associated with the lower back. Before you go rubbing any old table salt directly on your lower back, know that not all salts are created equal! And when it comes to alleviating the likes of back pain, there’s none better than Epsom salt. Epsom salt contains high concentrations of magnesium, a well-known natural muscle relaxant and anti-inflammatory compound. Dissolving a generous handful of Epsom salt in your bath, then climbing in and letting it seep into your sore back, will help those salts to work their magic and get you back in action (so to speak) in no time. Hey Buddy!, I found this information for you: "5 Ingredients To Put On Your Skin For Lower Back Pain". Here is the website link: https://www.thealternativedaily.com/5-ingredients-to-put-on-your-skin-for-lower-back-pain/. Thank you.